If you’ve ever noticed a draft in your house, there’s something very wrong with your insulation. A noticeable draft isn’t just annoying—it also increases your utility bills significantly. 1. Even the smallest leaks in ducts force your A/C and heating system to work overtime. Typically 20-30% of airflow is lost in the duct system. Those leaks are just about impossible to find without specialized equipment, so they usually go unnoticed for years. During that time they cost you hundreds or even thousands of dollars in energy costs. 2. Typical insulation materials settle over time. If you cut open a wall, you’ll likely find all the insulation from the bottom of the wall cavity. That means only the bottom 20% of a wall is insulated. The other 80% of your walls lack insulation in that case. 3. Windows, doors, and other openings on outer walls should be perfectly sealed. Unfortunately often they’re not quite tight, though. If you notice a draft, there’s a hole at the same spot on both sides of the wall. Much more often the holes aren’t in the same exact spots, so you won’t notice anything. That still means air leaks into the wall. No matter which side of the wall the holes are, they make a huge difference to insulation effectiveness and utility bills. 4. Pipes and cables travel in almost all walls. The holes they need in the wall structures are always bigger than the pipes, which leads to air traveling between sections of the walls. Combined with any of the other problems this makes insulation even worse. Your information remains 100% private. When you hire someone to improve insulation, they likely add more of the same of insulation into your walls. And that’s usually all they do. On top of creating a mess in your house—often for days—it doesn’t solve most of the problems. The extra insulation might get a bigger portion of your wall cavities insulated (although, it’s never 100% with common insulation). But it won’t stop leaks around windows, do anything about leaky ducts, or fill the gaps around pipes and cables. 1. It fills the entire wall cavities, so your walls are insulated from floor to ceiling. 2. It doesn’t settle or break down (lifetime guarantee), so you don’t need to get it re-applied over and over. 3. It stops drafts and fills leaks around windows, doors, and other openings in walls. 4. It stops allergens, pollution, and critters from entering your house through cracks in the walls. It’s non-flammable (Class 1 fire rating). It’s environmentally safe (it’s derived from organic materials and it’s biodegradable). It’s excellent for reducing sounds coming through your walls (more about this below). 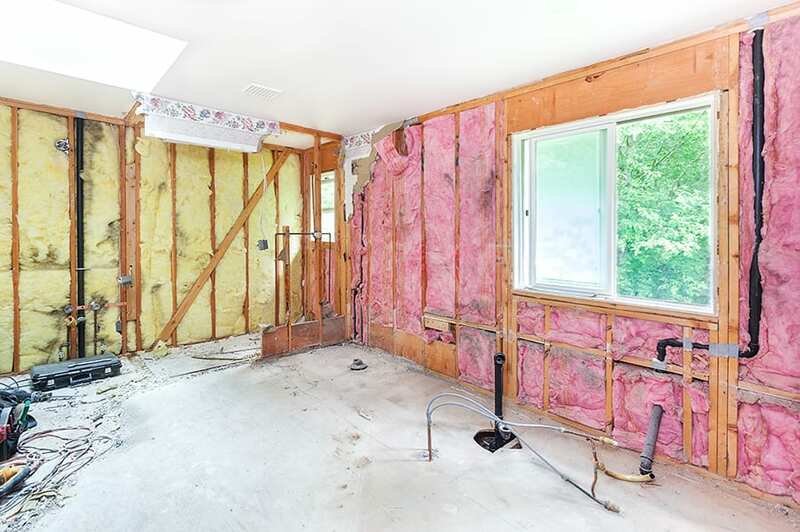 It’s better at insulating walls than just about anything else (only polyurethane spray foam can compete with RetroFoam’s R-values, but it requires all walls to be torn out before installation). It’s 100% toxin free (unlike, for example, fiberglass and polyurethane insulation). RetroFoam can be used in stud and masonry walls. It doesn’t matter what kind of insulation is already in the wall. Traffic noise, garbage truck, or neighbors children. Noise from outside can be very distracting. Even noise you’re used to likely creates stress and makes your sleep less refreshing. On the other hand, silence helps you relax and concentrate. Most people just never find real silence even at home, so they’ve forgotten how calming it is. One time we had only insulated the front wall of a customer’s house. He called our office to complain that we already left. We had just moved to the next wall. He couldn’t hear our truck and other equipment noise anymore, so he assumed we had left. RetroFoam doesn’t work for attics because there’s no cavity to fill with it. It only works when it’s sandwiched into a wall. So, we use fiberglass or cellulose insulation for attics. Since attics are usually not air conditioned, we don’t put insulation into the ceiling. Insulating the attic ceiling would make the roof shingles overheat, which often voids any warranties. If the attic is air conditioned, then the ceiling can be insulated normally. No matter what insulation method is best for your attic, we test for leaks and seal them before any other insulation. That often makes the biggest difference to both home comfort and utility bills because leaks from the attic are so common. Let us come and test your current insulation. We’ll use a digital thermal image camera to see where heat is leaking. We also do a blower door test to check how tight the current insulation is. If there’s nothing to fix, the tests show that. If there is something to fix, you can see what exactly it is, where it is, and how significant it is. Either way, this costs nothing for you. You can then decide if you want us to fix your insulation. It’s guaranteed to reduce your heating costs. A typical insulation project is done in a day. Typically RetroFoam insulation is done through the outside walls, so there’s no need to move furniture. Call us now or contact us online to get your FREE estimate. We’re happy to answer any questions you have.